Active Schools, in collaboration with Lakeshore Foundation-NCHPAD, issued a Survey of Providing Inclusive Physical Education and Physical Activity and Meeting the Needs of Students with Disabilities to Active Schools’ champions who identified themselves as a PE teacher. The purpose of this needs assessment was to identify current practices and needs to providing inclusive PE among teachers. The survey addressed participation levels, class strategies, after school programs, certifications, support, teacher preparation and the built environment. 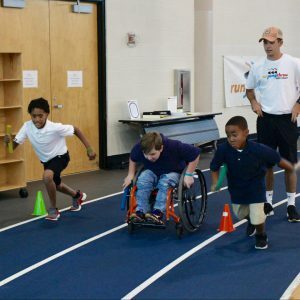 Click the link below to learn more about the current state of inclusive PE and physical activity while exploring conclusions and recommendations that provide opportunities for improvement. Lakeshore-NCHPAD believes that physical activity is essential for individuals with a disability to lead healthy, active and independent lives. This is especially true for our nation’s youth. 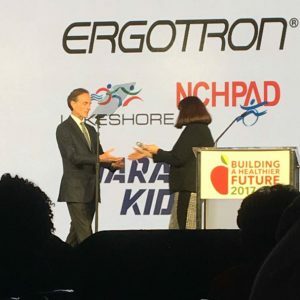 At the 2017 Partnership for a Healthier America’s Building a Healthier Future Summit in Washington, DC, Lakeshore was awarded as an Active Schools partner of the year for playing a critical role in mobilizing resources for social change and elevating awareness in support of inclusive physical education and physical activity environments. 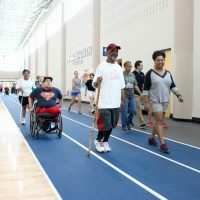 The National Center on Health, Physical Activity and Disability (NCHPAD) and the American College of Sports Medicine (ACSM) are celebrating 10 years of promoting physical activity inclusion under the IFC. In 2007, NCHPAD and ACSM joined forces to begin the national initiative. 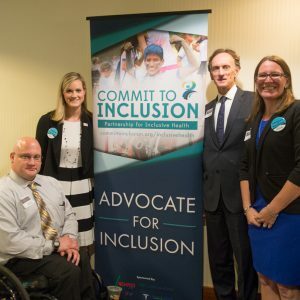 More than 210 member organizations representing national and international disability, advocacy, fitness, sports, health and rehabilitation interests committed to the common vision of universally inclusive fitness opportunities now have a new charge. Under the umbrella of a global campaign, Commit to Inclusion, the new Partnership for Inclusive Health will unite national and international organizations behind disability inclusionary practices in healthy community efforts. This new charge to build inclusive health communities will include Guidelines for Disability Inclusion in Physical Activity, Nutrition and Obesity Program Initiatives to help people with disabilities who face significant barriers when attempting to access health and wellness activities. The Guidelines are used to assist communities in promoting higher rates of inclusion among their members with disabilities. On September 8, 2015 the United States Surgeon General issued a Call to Action to promote walking and walkable communities. As a leader in the promotion of physical activity for people with disability, Lakeshore was pleased to play a role in the launch event and thrilled to be mentioned in the Surgeon General’s announcement. We also provided an inclusive walking story from a Lakeshore member in a Partner’s Guide to Promote Walking and Walkable Communities published by CDC. In support of the Surgeon General’s Call to Action, NCHPAD launched the How I Walk campaign. This campaign promotes walking as a universal term and highlights the many ways people walk in their communities and at Lakeshore. In June 2017, America Walks and the National Center on Health, Physical Activity and Disability (NCHPAD)– Lakeshore Foundation are excited to announce the awards of the Designing for Inclusive Health Micro Grant program. The program awards funds for projects related to supporting disability inclusion strategies that make healthier choices the easier choices for all people in areas where they may live, learn, work, play, pray, and receive care. 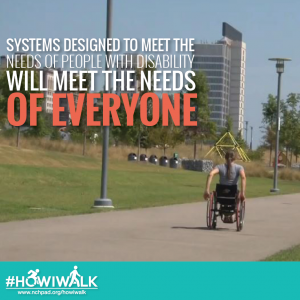 Walkable and active communities lead to improved safety and health for community members of all backgrounds and abilities. They encourage broad involvement by all in the design and planning process, and are places where safe, accessible and enjoyable opportunities to be physically active are available to everyone. The projects highlighted in this initial round of grants are working to make sure all community members including people with disabilities have the opportunities to be active, healthy, and engaged with their neighborhoods. Words have the power to educate and empower our society. They can also change the lives and perspectives of individuals with disability in the Birmingham area and beyond. Because of this, Lakeshore’s policy and public affairs department created a toolkit to promote the use of person first language by local media and other audiences. This toolkit acts as a guide for media personnel to use the proper words and set appropriate notions when interviewing or speaking about individuals with a disability.